Escape from Beckyville: Tales of Race, Hair and Rage is the debut short story collection by Nicole D. Sconiers. 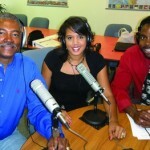 Since the book’s release in July 2011, Ms. Sconiers has been interviewed on Sunday Journal, WYLD 98.5 FM in New Orleans, “Voices” radio program for the New Mexico Office of African-American Affairs, Shaw University’s “Traces of Faces and Places” program and was featured in The Carolinian newspaper. She was also a guest on The Serena Sol Brown radio show. Madame Noire, the popular health and lifestyle magazine dedicated to black women, recently profiled Nicole Sconiers on their website. Check out the article! 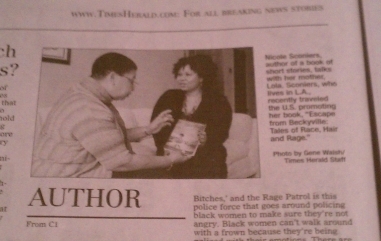 The Times Herald, the newspaper Nicole D. Sconiers used to deliver as a kid, recently featured a two-page spread on the author and her mother, Lola. Read all about the hometown love! Nicole Sconiers chats with Theresa Sanchez of the Sunday Journal on WYLD 98.5 FM in New Orleans. Ms. Sconiers discusses black women, speculative fiction and wise great-grandmothers. Take a listen! Award-winning broadcaster Christabel Nsiah-Buadi interviews author Nicole D. Sconiers about her self-publishing journey and black hair, relationships and race. Check it out! 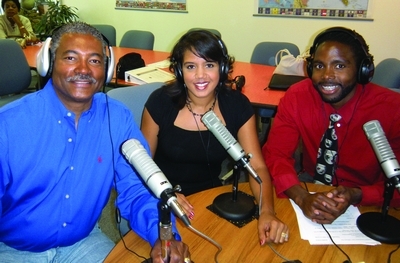 Host Gary Williams of “Voices,” the radio program of the New Mexico Office of African-American Affairs, interviews Nicole D. Sconiers about her cross-country tour and just who is Becky. Listen now!